Amidst all the noise around rising and fall unemployment, expected hiring activity and raises professionals can expect, there is a more fundamental shift taking place in the open talent economy almost under-the surface. Much like the tectonic plates whose shifting can lead to the creation of new land-masses and mountains, we are seeing shifts in the way companies and professionals think about and organize work that is leading to the creation of a new industry and ecosystem – one that revolves around flexible working and the services needed to make them productive. The tectonic plates that are shifting in this instance comprise: a far greater desire by professionals to better control their work and life, especially given the blurring lines between the two; the emergence of ‘millenials’ in the blended workforce that prize learning and challenging roles above other aspects of work, and that therefore need new solutions to keep them engaged; and a sharper focus by companies on accessing the skills they need to deliver a certain output or impact, and leveraging a broader set of work arrangements to deliver on this objective. While this pressure if felt more keenly by start-ups, SMEs and boutique services firms who want to maintain a more nimble project budget, larger organisations are veering towards this too. One can argue that these trends have been around for a while and that is absolutely true. However they have been growing stronger, and have received a jolt or fillip by the global crises of 2008/09 which has forced both sides of the professional gig economy to focus much, much more on skills, agility and nimbleness versus only career tracks. We talk in this piece about the landmass created through these shifts, one that we will see get more and more visible over the next decade or so – the freelance economy as an industry of course, but also an ecosystem with its growth spawning a range of services catering to it. In this piece we highlight the major trends we see emerging in the ecosystem, and would look to explore each in subsequent write-ups. 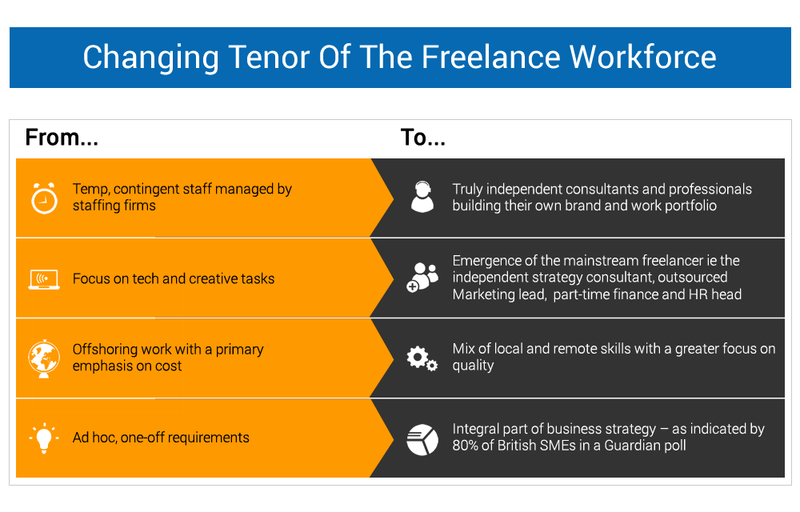 The value of work done leveraging freelancersis growing exponentially and this trend looks to continue. The global remote work industry - which is a sub-set of the professional gig economy –is estimated at close to 2b USD in 2014 and expected to grow to 5b by 2018 giving it a CAGR of over 25%. Independent estimates (from the Bureau of Labour Statistics, Staffing Industry Association, the Freelancers Union and Government Accountability Office) indicate that anywhere from 25-50% of the US workforce by 2020 will be freelance, and Deloitte in a recent report spoke of the move to an ‘Open Talent Economy’ where their estimates indicated that half of the resources a company relies upon to get work done will no longer be on its formal payroll by the end of this decade. These factors are leading to a rapid growth in the number of online work platforms that are looking to innovate around how to connect the demand and supply of such skills. A second big trend we see is that what comprises the blended workforce and future of work is changing in several material ways. First, while freelancers in the past were usually temporary, contingent staff managed by staffing firms, we are now seeing the emergence of truly independent consultants and professionals building their own brand and work portfolio. One US estimate indicates that while today just under half the contingent workforce is independent workers, in another 5-6 years this will be 80% driven by more professionals pursuing the flexibility of independent careers and more companies opting for skills on an as-needed basis. Second, we are seeing the emergence of the mainstream freelancer i.e., the independent strategy consultant, outsourced Marketing lead, part-time finance and HR head, who is looking to build a high quality portfolio of work based on his/her expertise. In fact even closer home, in a survey Flexing It undertook to understand India’s freelancers, we found that almost 70% were drawn from core management functions versus from technical and creative fields which have traditionally been a sweet-spot for freelancers. Third, a core driver to opt for freelancers in the past was to offshore work to skilled professionals but with a primary emphasis on cost. While cost of course will always be important, we are now seeing demand emerge for a lot more local skills on an on-demand basis with a greater focus on quality. Finally, from ad hoc, one-off requirements we see freelance arrangements becoming a more integral part of business strategy. In fact, as per a recent Guardian Poll, almost 80% of British SMEs considered freelancers to be a big part of their business strategy. As mentioned earlier, from start-ups and SMEs that started the trend we are now seeing the beginnings of larger enterprises also co-opting freelancers to retain flexibility, source very specific skills and also to push the envelope on their diversity initiatives. 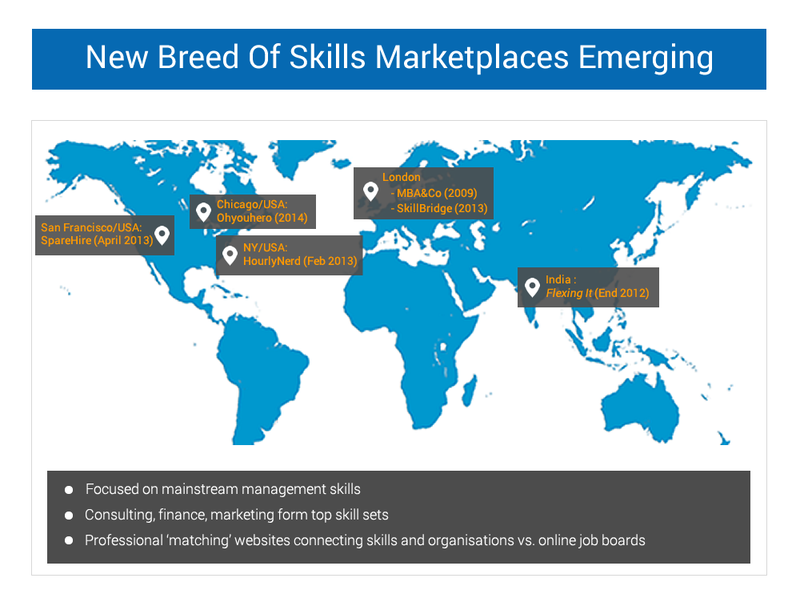 A by-product - and to some extent now a driver, of the shift up the chain to higher value skills has been the emergence of a new category of skills marketplaces. In 2005 when the freelancer platforms first began to gain momentum, most jobs focused on basic skills e.g., data entry, simple coding, other tech tasks. That’s beginning to change and the top categories in the last year even on the traditional freelance platforms were social media marketing, academic writing and research, business research, data analysis,design , in addition to translations, and demand for virtual assistants. 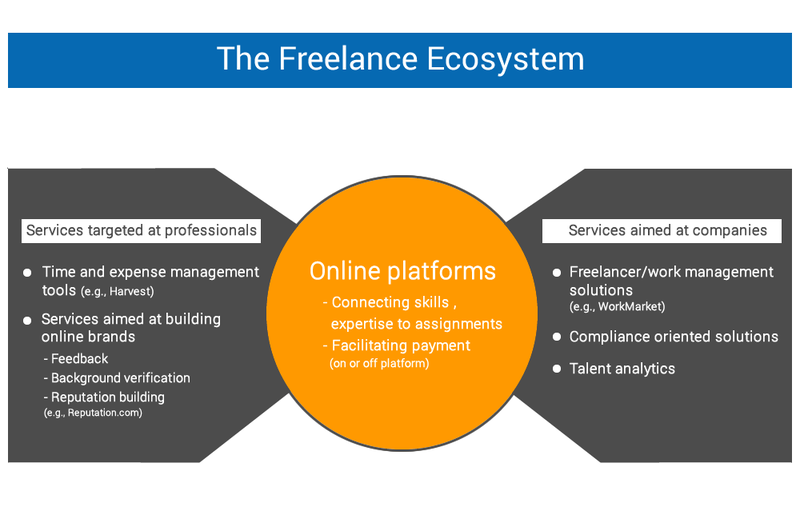 Betting on this rapid move up the value chain are marketplaces that focus on freelancing for higher-end skills. The last year and a half has seen several ventures emerge that connect consultants, finance professionals, marketing experts amongst others to organisations that need their skills on a defined basis. These include a few in the US – HourlyNerd, SpareHire, Ohyouhero; a couple in Europe including MBA&Co which is the oldest, and finally Flexing It in India. These ventures are focused on highly qualified professionals - for example over 95% of MBA&Co’s pool of professionals have a post-graduate degree and this proportion is 2/3rds for SkillBridge and similar Flexing It. For the demand side of these marketplaces, the rationale is to access freelance MBAs/professionals with the same brainpower as a top-tier consulting team. In fact, depending on how these scale, some of these marketplaces could have the potential to undermine segments of the traditional consulting industry. These newer marketplaces are also placing a greater focus on ‘skills’ and ‘knowledge’ and acting as professional matching platforms (along the lines of dating and matrimonial sites) versus the more traditional online job boards. This growth in the independent workforce is spawning a huge industry of allied services aimed at both sides of the market. For organisations there are now freelancer/work management solutions, one such example being Work Market in the US which helps companies find freelancers, check backgrounds, engage and manage them, rate performance and pay them. There are also interesting services aimed at professionals ranging from software to manage time and invoices (e.g., Harvest in the US that offers online invoicing) to solutions that help build online brands among others (e.g., reputation.com), among others. In summary, our view is that we are in the midst of a major change in how work will be delivered in the future. Even closer home in India, while we can argue that the pace of change remains to be seen, the trend is definitive and we are likely to see several new ideas and models emerge to cater to this need.